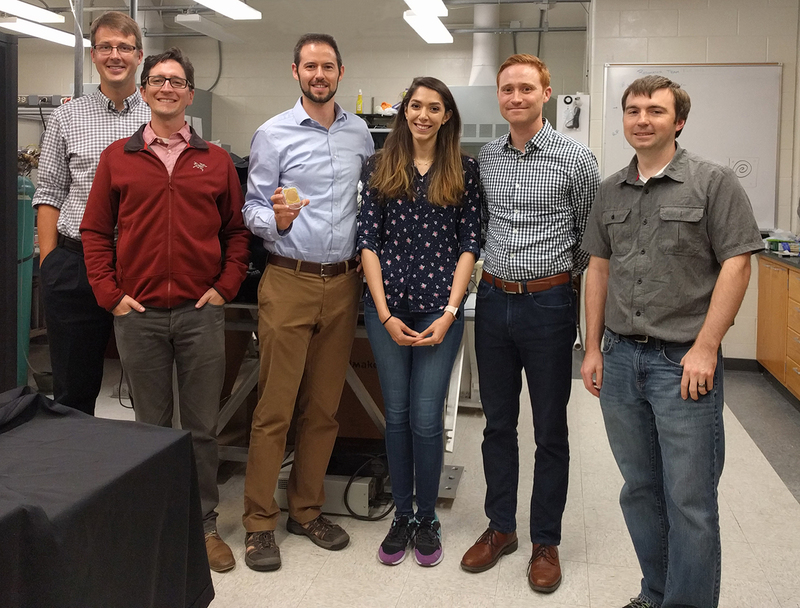 A consortium of young Iowa State university researchers has gone where few like them have gone before – as recipients of a large grant from the National Science Foundation (NSF) to mature and translate a platform technology with a global industry partner. The group, including four Iowa State assistant professors and one associate professor, have launched a project to develop materials and methods for scalable manufacturing of flexible resonant sensors and their wireless readers under support of a $750,000 award made available through the NSF Partnerships for Innovation (PFI) program The industrial partner on this award is DuPont with two co-PIs from their Advanced Electronics business. Iowa State’s researchers in the resonant sensor research project include (from left): Nathan Neihart, Electrical and Computer Engineering; Marshall McDaniel, Agronomy; Nigel Reuel, Chemical and Biological Engineering; Sadaf Charkhabi, graduate student, Chemical and Biological Engineering; Michael Bartlett, Materials Science and Engineering; Eric Zellner, Veterinary Clinical Sciences. Resonant sensors are simple circuits composed of inductive, capacitive, and resistive elements (LCR circuit) that tunes the resonator to oscillate current at a specific resonant frequency. The resonator can be used as a sensor by engineering the inductance, capacitance, and/or resistance elements to modulate when exposed to the desired analyte, which in turn affects the resonant frequency. This resonant frequency can be observed wirelessly at a step-off distance of 1-10cm using a low-power, vector network analyzer (VNA) coupled to interrogation antenna(s). 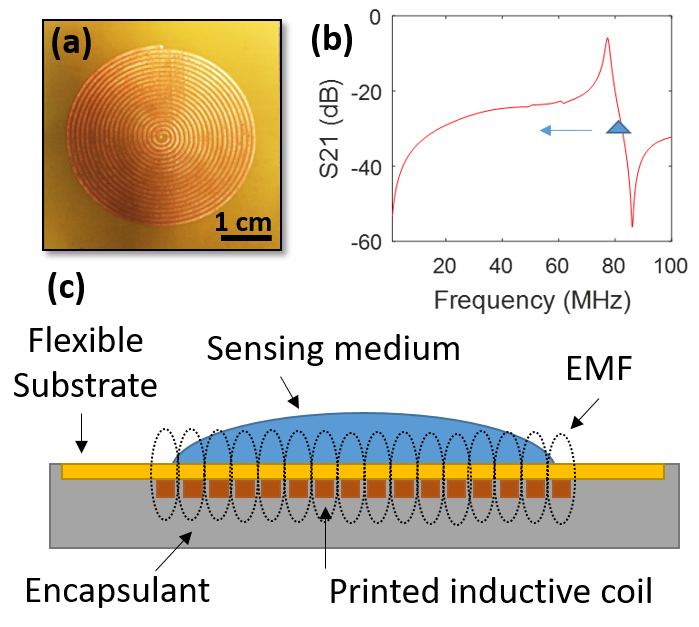 Resonant sensors have been demonstrated previously measuring temperature, humidity, and pressure. The research team at ISU is developing a growing number of flexible sensors for detection of enzymes, proteins, biofilms, tissue types and ions. “Materials and Methods for Scalable Manufacturing of Resonant Sensors and their Wireless Readers” involves the work of Reuel; Nathan Neihart, associate professor, Department of Electrical and Computer Engineering (co-principal investigator); Michael Bartlett, assistant professor, Department of Materials Science and Engineering; Marshall McDaniel, assistant professor, Department of Agronomy; and Eric Zellner, DVM, assistant professor, Veterinary Clinical Sciences, College of Veterinary Medicine. The project also involves two co-principal investigators from DuPont – Dr. Sang-Hwan Kim and Dr. Lujia Bu who have expertise in flexible electronics and scalable manufacturing methods. “As a recipient of a PFI grant from NSF, we are tasked with using research funds to impact economic development in the near term, to make products that will change the world. Grants such as this promote technology that have the potential to make a big difference – but the key is how do you get it out the door for market adoption?” says Reuel. The PFI grant and the project brings together academic representatives and companies to develop scalable product prototypes. The end goal is that the group will create a startup company and apply for seed funding through two government programs, SBIR (Small Business Innovation Research) and STTR (Small Business Technology Transfer), which are seed funds for public/private sector business partnerships. 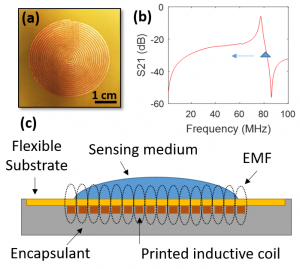 The flexible resonant sensors and their wireless readers being developed through industrial partner DuPont will be applied to many different commercial uses. “What we are developing is a platform technology,” Reuel explains. A platform consists of technologies that are used as a base upon which other applications are developed. “There is a lot of potential for this type of sensor, and that is appealing to DuPont,” he says, adding that a good deal of market data and proof of concept data went into a presentation to DuPont prior to the grant being received. The NSF states that the potential of this PFI project is to enable commercialization of a platform sensor technology — flexible resonant sensors — that has many potential applications in consumer, agriculture, and health markets. In the consumer market, the sensor system can be applied to wearable technologies to monitor stretch and strain such as in performance athletic wear. In agriculture, the sensor system can be applied to soil and water quality monitoring. In health, the sensor system can be applied to monitoring manufacturing of biotherapeutics and the health status of closed wounds. Advantages of this sensor platform are its passive unit architecture (no on-board power), potential low cost, and ability to measure in closed systems. In addition to technical innovation, the broader impacts of the research will include increased employment opportunities and economic development; and will involve and train graduate and undergraduate students with technical skills in materials, electronics, and characterizations tools in an interdisciplinary environment. They will also receive valuable innovation skills in product design, reliability, robustness, and commercialization due to the project scope and inclusion of active industrial partners. It will also devote special attention to students underrepresented in STEM fields. Other sensor projects involving some of the faculty members involved in this research can be found here and here.